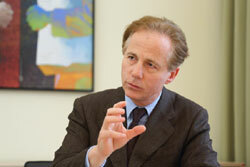 Georg Kapsch, President of the Federation of Austrian Industries (I) calls for a VAT increase. The VAT rate remains unchanged at 20% of decades. This article includes a total of 220 words.